This style is estimated to ship in 16-20 weeks. This collection features alabaster stone coupled with luxe metals. The carved alabaster pieces, set in a prong setting of rich natural bronze, possess a poetic, paired-down luxury of easy refinement. A dramatic and architectural take on Kelly’s signature use of mixed metals and geometric forms, this refined and bold pendant juxtaposes organic feminine curves with sleek masculine precision. Its distinctive voice is full of modern sophistication and soul. Attaining a seamless coexistence of form and function, the Larchmont Long Pendant derives inspiration from Pre-Modernist architectural styles with particular attention paid to materiality and geometry. 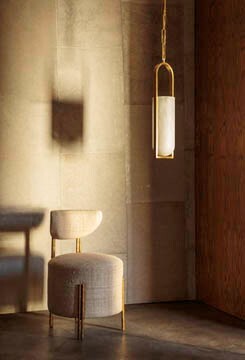 This hanging pendant directs light both upward and down and is available in Antique Brass, Polished Nickel or a combination Brass/Bronze mix, each with Frosted Glass. This fixture is rated for use in damp locations.